Trailblazer 1-Quart Aluminum Canteen Kit | BUDK.com - Knives & Swords At The Lowest Prices! 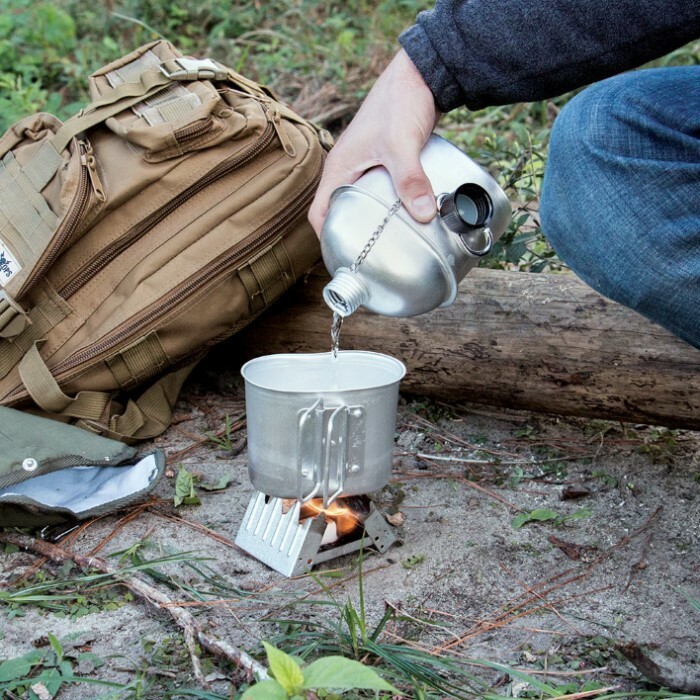 Our 1-qt Canteen Kit is a great compact addition to your camping or hiking gear. 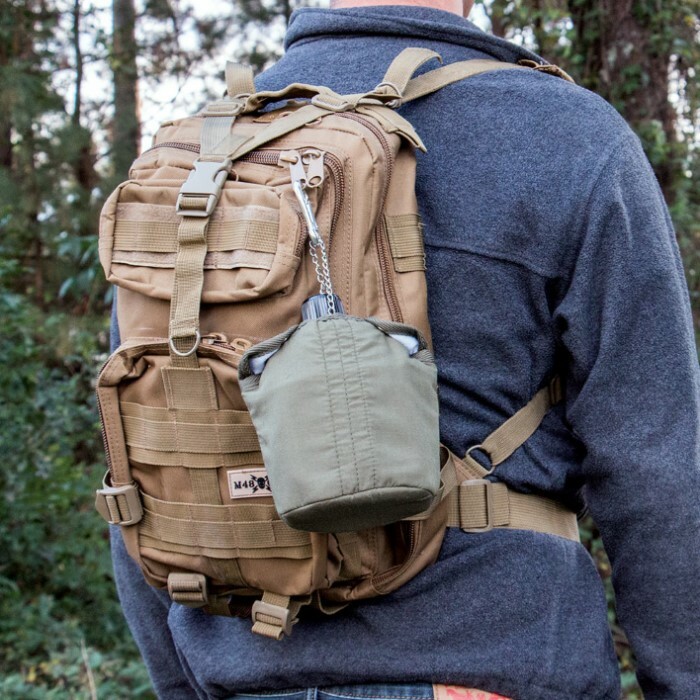 It features a chain cap that has a carabiner so that you can just clip it to your pack. 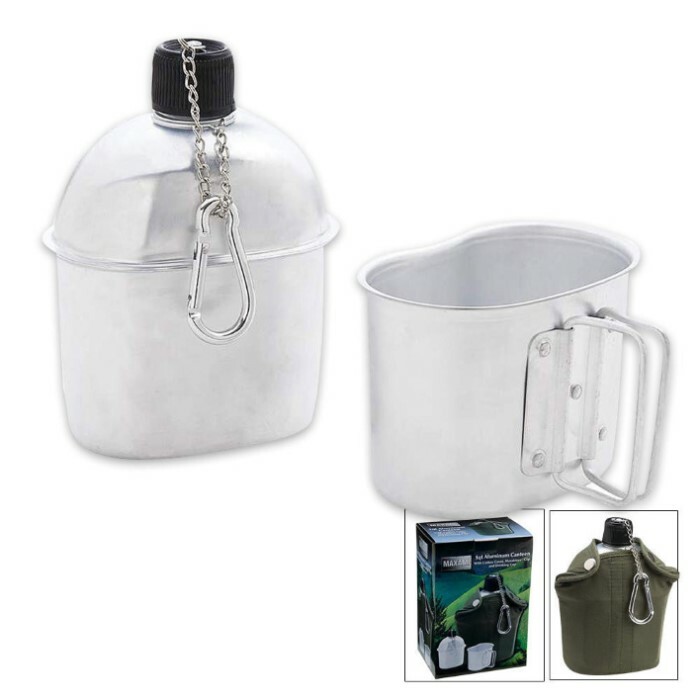 The kit includes a one-quart canteen and a cup, which all nests inside a cotton cover with snap closures. Both canteen and cup are constructed of durable aluminum. Scrap that old canteen with the cumbersome strap! What could be easier than just clipping it to your pack? I really like the canteen. It comes with a cup that can be used for drinking or soup and the carrying case has 3 ways to carry it. You see the clip on the picture but the case can also be carried on a G.I. web belt or on a regular belt too. I had this item in the high desert hiking/camping two months ago and it performed flawlessly. Hiked brutal terrain sipping canteens contents, made it tired to my rocky meadow camp site, poured the canteens water into the nesting cup which with pouch saves lots of space, and boiling the water on a tiny alcohol stove poured it into a Mountain House zip pouch for a quick meal before turning in as a tired tator. You can’t beat this item for that kind of awesome function. It’s aluminum, not steel, but if you take care of your gear like I do so it takes care of you, then it’s fantastic for the money! Buy the lid later like I did, and you’ve got a small covered pot for fish and foraged greens in a survival journey scenario. I recommend this item for any sharp hiker or camper! If careful with it, it should hold up. Not WWII quality, but at this price, not too bad. For the price you can't go wrong. It's light weight but seems that it will hold up to normal use. The cover is thick enough that between it and the cup covering the canteen it should keep you water at a good temp for drinking. The cup is the perfect size for a quick meal while hiking or camping. It's not heavy duty by any means but for the price it's a great value and and should do the job for most people needing a canteen this size, with the detachable cup being a big plus. Can't beat it for the price. Plus free shipping! Where else can you get a canteen, cup, cover, and carabiner delivered to your mailbox in 3 days for less than 7 bucks? The answer is, "Nowhere but Kennesaw Cutlery!" an excellent canteen and keep my water very fresh! I love this canteen! it is aluminum,so you are able to boil water inside of it if you need to. it fits wonderfully inside the Cozy insulating Holder, and The Pot that fits on the bottom of the canteen is perfect for Soup, Oatmeal, and many other foods. Arrived on time and as described. Does its job well, but the carabineer broke off the second I went to use it. Wasn't planning on using it so that didn't bother me too much, just don't get too rough with this. No Nasty plastic taste with this canteen. OD cover helps keep water cool. Use it working in the yard and taking the dog for a walk. He likes the cup he can drink out of. For less than seven bucks you can't go wrong. Lightweight and much thinner than the WWII vintage, but when filled with liquid and the cover on, it works just fine. I purchased a separate cup and two stainless steel lids. Don't know if it's the lids or the cups, but they don't make a secure 'snap' on cover. But works fine covering the cup while heating liquids. I especially like the belt loop on the cover, keeps the canteen close to your side.